One fantasy that should have never been finalized. Final Fantasy is one of the longest running RPG franchises of all time. Gamers have spent countless hours crawling through dungeons, connecting with protagonists, and defeating god-like antagonists. Released on January 11, 2018, Final Fantasy Dissidia NT is a an arcade style battle royale fighting game featuring some of the most iconic heroes and villains to appear in any of the many series entries. Developed by Koei Tecmo’s Team Ninja and published by Square Enix, the Playstation 4 Exclusive is promising to bring intense battles between fan favorites. Does this brawler do the Final Fantasy fans justice? Since the introduction of 3D graphics in games, Square Enix has pushed its development teams to achieve incredible visual moments. Unforgettable moments in games like Final Fantasy 7’s death of Aeris to Final Fantasy 15’s planet sized enemies have been a staple of the game. And Final Fantasy Dissida NT is no exception. Every cutscene looks breathtaking. Stage design is truly fascinating. The entirety of the games visual bring to life the arena that Dissidia NT has created within multiple worlds of Final Fantasy. With a ton of action happening on the screen, there were no memorable frame rate drops or broken visuals of any sort. Running on a day one PS4 the game remained fluid and well constructed, so it’s hard to imagine this is its best form. Final Fantasy games are typically well known for the depth of their plots. Unfortunately, the gameplay makes it so difficult to play the game that the plot is heavily hindered by it. By placing the plot behind a gameplay wall, Koe Tecmo made an interesting gamble. Had the game been more playable or even fun in the slightest bit this would have worked incredibly in their favor. The gameplay is so complicated and uninteresting that it makes acquiring the necessary memoria items feel more like a burden than an adventure. From what can be read online the plot is rather interesting however no one should have ti sit through the gameplay to enjoy it. Forgettable. The soundtrack is good but that’s it. It’s just good. For a franchise that typically has incredible music scoring, this game just felt bland. Perhaps the frustration in the gameplay mechanics was distracting from the sound. In battle sound effects never sounded like something overly impressive. The in battle sound effects were expected which isn’t a bad thing, but it isn’t brag worth either. Voice overs were handled well enough to match the quality of the cut scenes. However, that should be expected from a franchise that has had multiple successful cgi films. Again, nothing blatantly bad but also nothing memorable. Never has their been a more clustered setup for a video game. #onlythefacts. Just looking at the novel of a tutorials menu is enough to push the casual gamer as far away from this game as possible. The tutorial has to break down so many control schemes and game mechanics that playing the game frequently feels like an unwanted chore. Having a battle system that consist of two complete different health meters is outrageous. One meter is the stamina bar which as it widdles down adds to the players stamina. Once the enemies stamina is brought down to 0 the player can now attack the health bar doing damage equivalent to the amount of stamina the player has. Only being able to control one of the three selected characters takes away control of special combos that could turn the tide of battle. Once things seem to makes sense the game introduces an entirely different winning condition based around acquiring summoning crystals. The differences between these two winning conditions take up 6 or 7 tutorial menus themselves. Ultimately the game gets in its own way with all the different mechanics it tries to incorporate. As with most character clashing games, the concept is extremely fun sounding. The application on the other hand, not so much. Perhaps with clearer less clunky game mechanics and a better way to experience the plot, the game could be tons of fun. The things that could make this game fun in its current state would result in an entirely new game. There is definitely a market for this somewhere because Dissidia NT is technically a remake of an arcade remake of a psp game that would have been third in the series. Without playing the previous versions, there is no way of knowing if this game remains true to the original outline. Either way, the most fun part of this game is admiring iconic 8bit and early polygonal characters step into the current generation in the character select screen. Final Fantasy Dissidia NT is a major disappointment. 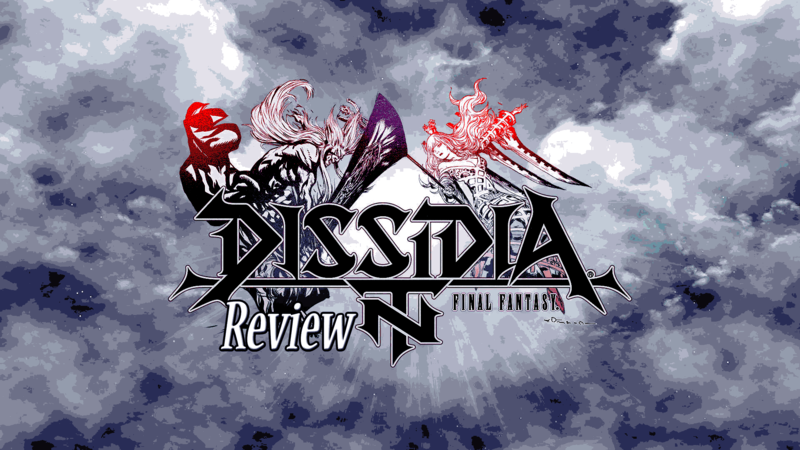 Dissidia NT lures players in on the premise of seeing some of there favorite characters battle it out and then ruining the experience with complicated control schemes and other odd gameplay mechanics. True die hard fans of the franchise may find the strength within to sit through this and enhance their Final Fantasy lore experience but most people may be deterred quickly. The idea of Final Fantasy Dissidia NT is very exciting, the execution on the other hand, not so much.